This is a recipe for Orange Pound Cake with orange glaze, surrounded by beautiful sugared cranberries. Moist, dense yet fine textured, this pound cake recipe is flavored with grated orange zest and fresh squeezed orange juice. It’s a perfect cake recipe for Thanksgiving or Christmas and one that will give any Holiday cake recipe a run for its money. No one should live without pound cake and especially one that’s flavored with orange and topped with a luscious orange glaze. This is one of those recipes that’s easy enough for a beginning baker to tackle. It’s impressive enough to be an incredibly rewarding baking project to showcase at your next Holiday party. And it’s my new favorite cake recipe, edging out Creamy Banana Coffee Cake which is another recipe you might want to keep in your back pocket for Holiday entertaining ideas. Pound cake gets its name not because it’s heavy but because it’s easy. Based on an old-fashioned method using a pound each of four ingredients: flour, sugar, butter and eggs. But don’t let its simplicity fool you into thinking it’s a pushover in the flavor department. Designed to be made without a recipe, pound cakes have evolved into some clever flavor combinations that will wow guests at any gathering. This is an easy and super rewarding pound cake recipe and reliable because it’s from Ina Garten, Barefoot Contessa. Beautiful with citrus flavor, this is a perfect recipe to make for any Holiday party, whether it’s your own, or when you’re invited out. Tis the season for Holiday gatherings. Easy! Just pick-up a 12-ounce bag of fresh cranberries at the grocery store. You’ll need two cups of sugar, divided. 1/2 cup to make the syrup to coat the cranberries and 1-1/2 cups to coat the cranberries for that frosted cranberry appearance. Just combine 1/2 cup sugar and 1/2 cup water in a sauce pan. Cook over medium heat until sugar is dissolved, about 2 – 3 minutes. Stir in cranberries until they’re coated well with the syrup. Using a slotted spoon, transfer the cranberries to a wire rack over a sheet pan. Let dry for at least an hour. Working in batches, roll the sticky cranberries in the remaining sugar until well coated. Let dry for at least another hour. Done. I hope you give this Orange Pound Cake recipe a try. And if you do, please come back and let me know how you liked it and give the recipe a star rating. Your feedback is valuable to me for developing future recipes. And if you have a favorite pound cake recipe, let me know, I’d love to give it a try. This orange pound cake was so easy and rewarding, I’m really looking forward to trying more recipes. Here’s a few I found that sound absolutely irresistible. This is a recipe for Orange Pound Cake with orange glaze, surrounded by beautiful sugared cranberries. Moist, dense yet fine textured, this pound cake recipe is flavored with grated orange zest and fresh squeezed orange juice. It's a perfect cake recipe for Thanksgiving or Christmas and one that will give any Holiday cake recipe a run for its money. Easy! Just pick-up a 12 ounce bag of fresh cranberries at the grocery store. You'll need two cups of sugar, divided. 1/2 cup to make the syrup to coat the cranberries and 1 1/2 cups to coat the cranberries for that frosted cranberry appearance. Just combine 1/2 cup sugar and 1/2 cup water in a sauce pan. Cook over medium heat until sugar is dissolved, about 2 - 3 minutes. Stir in cranberries until they're coated well with the syrup. Using a slotted spoon, transfer the cranberries to a wire rack over a sheet pan. Let dry for at least 1 hour. Working in batches, roll the sticky cranberries in the remaining sugar until well coated. Let dry for at least 1 hour. Done. I make lemon bread and banana bread at holiday time to send to friends and family. 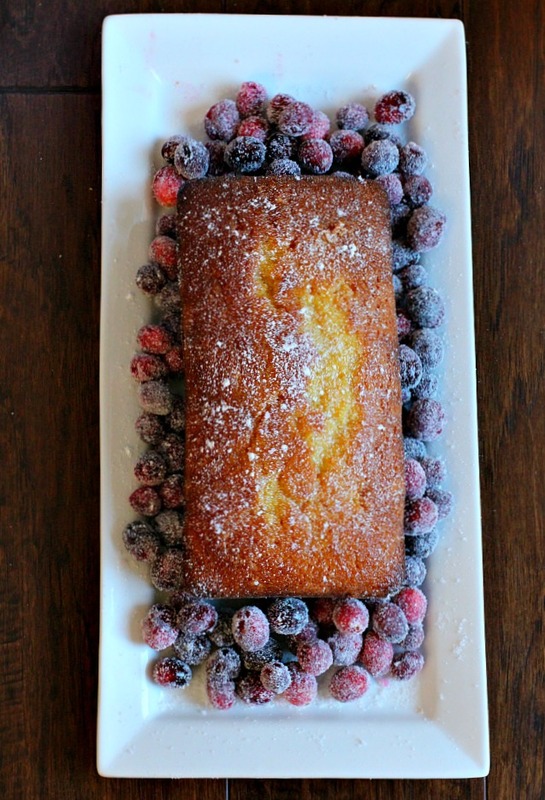 I think I might replace the banana bread with this wonderful pound cake. I wonder if I could put the cranberries in the batter so it would travel better. I will whip up a test batch this week. Thanks Lea Ann!